I recently had to debug an issue with Bind DNS queries. Thankfully this was a new instance and nothing was affected by it. One tool that proved essential for debugging this was the bind query log. now that it logging has started, you can tail your ns1.log file to view the status of the incoming queries and better diagnose any queries that are causing problems. I wouldn’t recommend leaving this on for an extended period of time if you expect that the server is going to be resolving a lot of DNS queries. This file has the potential to fill up fast! I’m a huge fan of netstat, however it’s arguments aren’t nearly as straight forward as many other commands. The netstat command allows you to view a variety of networking info (listening ports, active ports, active connections, etc.). The difficulty might be because the command offers so many arguments that it can be hard to find the exact ones that you want. I’ve compiled a list below of the netstat commands that I use the most often. Aggregate all incoming http network connections and then group them by incoming IP then sort them from least to most. This especially comes in handy for early detection of a Denial of Service attack. Show all connections (source + destination + ports) to the server. This can also get very long! Want to know what process is using which port? This command will show you which process is responsible for which port that’s actively listening or being used. LVM has created some pretty amazing features. We can now add, remove, extend, shrink, and snapshot volumes very quickly and easily. Since the overhead of LVM is so small and there are so many features, I enjoy using LVM partitions quite a bit. We can combine multiple drives to make them look as one. To create a new LVM partition we will create a partition with fdisk and assign it type 8e (Linux LVM), then initialize it as a physical volume, then create a volume group, then create a logical volume within that volume group, then format it and mount it. It’s that simple! #type "w" to write it out and save it. That’s it! Now you can mount it wherever you want and begin using it. Don’t forget to add it to /etc/fstab so it shows up on your next reboot. The process to extend a LVM partition is very similar to creating one. The best part? for 2.6 Kernels using ext3 you can do this on the fly without un-mounting your drives! resize2fs /dev/myVolumeGroup/myLogicalVolume #for ext3 and 2.6 Kernels works with mounted partitions! There are a few tools that you can use to verify/monitor/look at your LVM partitions. Run without any parameters will display all items that it finds. A little known “feature” of LVM is that by default, it reserves 5% of your blocks. This comes in handy when an LVM partition gets crippled from overflowing. You can use tune2fs to free some more space up. I wouldn’t dip into these reserved blocks if not necessary though! While I’m not a fan of SWAP memory, there are certain cases that can really save you by using swap. Would you rather get out of memory errors, or have a temporary slow down? Another handy trick to “create” more swap space when you aren’t using LVM or don’t have an extra partition laying around is to create a swap file yourself. One very cool (and often overlooked) feature of mysql is the use of mysqld_multi. This script allows you to run multiple instances of MySQL server on a single box with one set of MySQL server binaries. You’ll just need to specify different configuration parameters (port, socket, log file locations, etc.) in your my.cnf file. I’ll go through how simple this can be so setup below. First, you’ll need to create a new user that will exist on all server instances and will only need the SHUTDOWN privilege. You can probably guess this, but this user is needed to initiate a shutdown on the specified server. Since you will have multiple instances running on one server, the default init scripts will no longer work to shutdown anything but the default instance. Next, we will need to edit our my.cnf file. The first difference here is the general layout. First, you will have a section for [mysqld_multi], then each section after will be for the specified mysql instance. For example, if you have 3 sections defined – [mysqld1], [mysqld2], [mysqld3] – you will have places to configure 3 different mysql databases. Next, we can begin defining our first database. I like to define all of the following as a minimum to get the server up and running. All other variables not defined will use the defaults given to it. That’s it! Your first database is ready to go. I wouldn’t recommend leaving all other variables at their default, so be sure to know what parameters you want to configure and which ones you can leave alone. For safety, I usually delete the default mysql init script and replace it with one that will utilize the multiple databases. The MySQL RPM will provide this for you here: /usr/share/mysql/mysqld_multi.server. Copy this to the init run level of your choosing and don’t forget to make the necessary changes to chkconfig. StrongMail is sort of a less-known product that I have a ton of experience with. It offers business class email solutions to companies. In other words, it allows you to send out a lot of email in a short period of time. I’m only going to make this one post about StrongMail, but if you want me to continue talking about it please post in the comments. This is essentially just a brain dump of what I can think of right now. The services will be interrupted only in applying update and usually take no more than 10/min. The only box you can upgrade to 5.2.1.7 is the one currently on a 5.2 build, if you have other older version box, you need contact our AM to get on 5.2 build first. If you don’t keep up with the latest and greatest, you will most likely need to get an upgrade package from SM, but I thought this is a neat little trick. Once a month, StrongMail comes out with the latest LiveUpdate package. This package is very important to keep the bounce and throttling rules up to date. The downfall of this is that it requires restarting all of the services once the install is complete. Restarting StrongMail can take up to 30-45 minutes. StrongMail will report that everything restarted correctly, but it needs a “warm up” time. I never have gotten a good explanation of what goes on during this… Coincidentally, this “warm up” time is about the same time it takes to write a report to StrongMail support about what’s going on. on the left hand navigation, there is a link called “Live Updates”. Follow the instructions for an Online Installation. StrongMail offers a “SHAC” (StrongMail High Availability Cluster) which I’ve had some good experience with. This uses DRBD and Linux HA for automatic failover. The /data1 directory is the one being replicated (you will see that it isn’t mounted on the non-active SM server). If space starts filling up, the first thing to check is that the log processor is running and cleaning the logs correctly (/data1/strongmail/log). The next thing that I would check is if the old batch mailings are getting properly cleaned out (.db files that don’t start with “Trans_<site>.db in /data1/strongmail/data/databases). Each batch mailing creates 3 files in 3 separate directories. If mailings aren’t being cleaned up properly you will see files in any of these directories. Prior to version 5.2, we had to clean these up ourselves via a bash script. This may have also been caused by how we were using the API to create the mailings. Files in these directories that start with “Trans_” are for transactional mailings and should not ever be removed. This is the general process to rebuild a slave. In this example, we are rebuilding a database called DBX03. Stop MySQL on DBX03 and remove all of the current data. Depending on the reason for the rebuild, you may also want to remove the mysql database folder. Wiping clean the /DBDATA/mysql/* files would do the trick. Mount the snapshot and copy over the data to DBX03. (rsync -azvpP –stats –delete slave-svr:/mnt/DB_SNAP/ /DBDATA/mysql/ ). It would be smart to stop the snapshot script from running again so it doesn’t interfere with your work. These values can be used to populate the required data to start the slave. You should know immediately if the slave crashes or not. The slave status will calculate the time it’s behind master and report back. If there’s a duplicate key issue then you most likely started the slave in the wrong spot but investigating will be needed to verify. You can also tail the MySQL error log to view any additional errors. 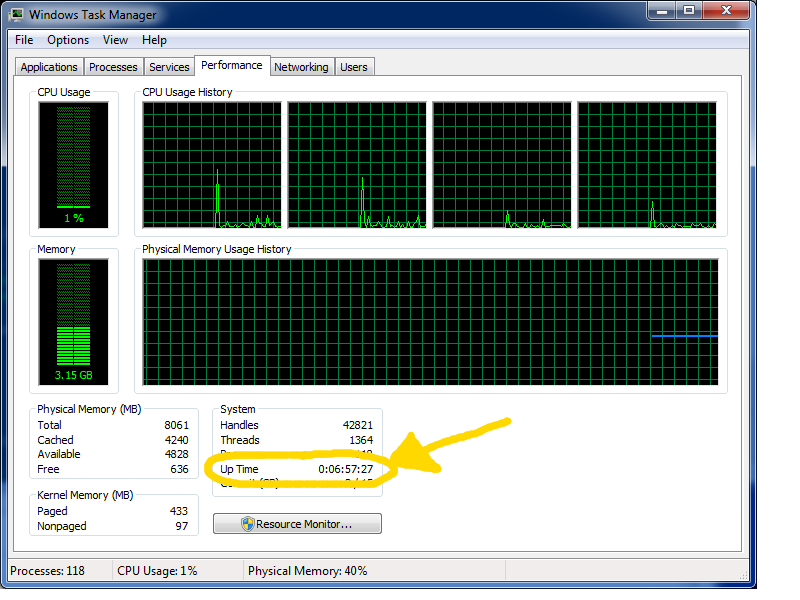 If you’re in the systems administration/engineering field, you are most likely as obsessed with uptime as I am. From time to time, it’s fun to see how long a server has actually been up and running. This is simple on Linux machines via the ‘uptime’ command. However, on Windows it has never been as straight forward. Here are 3 ways that you can find out how long a Windows box has been up. Open a cmd prompt (Start->Run->cmd) and type the following. C:\>net statistics server | Find "since"
Lastly, you can open the task manager (Alt+Shift+Esc, or Alt+Ctrl+Delete, or Start->Run->cmd->taskmgr). Under the “Performance” tab you will see a counter of system uptime. In the event of a disaster happening to a master db, the last resort is to fail back that master to a slave. This should be an absolute last resort due to the complexity of the issue. This could also be used as a method to switch masters for a big database change, such as adding an index to a table. This method can be used to minimize downtime from such a big change. When log-slave-updates=1, the slave is going to log ALL queries that come to it because it’s a slave in it’s binlog. In this case, you will need to be more careful. If promoting this slave to a master, you need to make 100% sure that no more updates are going to come through to it as a slave. Resetting the slave status and removing the slave configuration is probably the easiest way to ensure this. If you want to daisy-chain a slave off of another slave server, this paramater must be set so all replicated queries from the original master can trickle down the chain. When log-slave-updates=0, only queries for this specific server will be logged in the server’s binlog. This is most convenient when needing to quickly set this slave as the master and then point another slave to it because the only updates being logged to the binlog are those that are actually executed on this server without it being a slave. In this scenario, we will pretend that the master db is corrupt and we now need to promote a new one. First, check all slaves to see which one is the most caught up. If they are all caught up, then determine which one could be used with additional slaves attached to it the quickest (eg. log-slave-updates=1 as mentioned above). If a slave has another slave running off of it already, this is perfect. Make sure that the slave that you’re about to promote isn’t read-only (it should be read-only until you change it). Ensure this change is also made in the my.cnf file so the variable is set the next time this instance gets restarted. Next I usually shut down the master mysql instance for safety. For sanity, I issue a “FLUSH LOGS” statement on the new master. This will roll the server to a new, fresh binlog which will be easy to start new slaves from. Take note of this new binlog that was just rolled to. I switched DB02:3307’s master to be DB02:3306. The process for doing this without needing to rebuild the entire slave is very sensitive, but only requires a few steps. Assume that DB02:3307 is currently replicating off of a server called DB01. Now, if DB01 completely dies, these slaves won’t have to be rebuilt and DB02 will become the master. Then, once the slaves stop I know that both of the slaves were at the exact same location. This is crucial. The next step isn’t necessary, but I do it for ease and safety. On DB02:3306 I issue a “FLUSH LOGS;” statement which will close and reopen all log files. For the binlogs (which we are most interested in) it will start a new binlog so we can start at position 0 of the newest binlog on DB02:3306. Alternatively, you could just do a “SHOW MASTER STATUS;” to get the current binlog information for that host. Once I’ve found and noted the new master binlog file name and position, I can start that slave back up. Next, I go over to DB02:3307 to reset the configuration. This time with DB02:3306 as the MASTER_HOST, and the MASTER_LOG_FILE + MASTER_LOG_POS that were noted previously. I would argue that all of these commands and tips need to be mastered to be an effective SysAdmin DBA. The configuration formula… The estimated amount of memory that will be allocated to MySQL. This formula should be used when initially configuring a server while still leaving some for the OS (assuming that this is a dedicated MySQL database server). If a DB server begins to use a lot of SWAP memory, this is very bad. The disk thrashing that is occurring as a result of the SWAP being used has a reputation of bringing the entire db to a halt. I have witnessed this in several environments. If a high transaction MySQL db is using SWAP memory, immediate action should be taken before it gets worse. When this command is issued, statements won’t be logged to the binlog (or replicated) in this session. The skip current slave query statement. BE CAREFUL! Skipping a slave statement without a FULL, in-depth investigation can be VERY damaging and cause inconsistencies that may lead to a full rebuild of that data set. If you’re skipping a statement on the slave be sure that you know what you’re doing! With that said, this definitely can come in handy if a bad statement gets replicated and breaks a slave in your replication tree. These are the commands to start up new slave. I’m assuming that you have the correct data in place. I will have a separate post on how to build a new slave with full details later. Decode row based relay logs. I’ll have another post on how to debug row based replication errors. They’re definitely not as straight-forward as statement based replication issues.